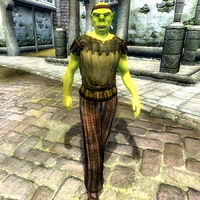 Gorgo gro-Shura is an Orc living as a pauper in the city of Anvil. He describes himself as a "Soldier of Fortune", but unfortunately nobody has hired him for ages, forcing him to depend on the goodwill of the Anvil citizens. One of these citizens, the equally struggling musician Jesan Sextius, has offered Gorgo a bed in his house until he gets back on his feet. While waiting for this to happen, Gorgo lives a very relaxed and laid-back life. He sleeps every night between midnight and 6am, gets out of bed to wish Jesan a good morning, then decides to go back to bed for another six hours. He finally rises at noon and exits the house for a two-hour lunch with Jesan at The Count's Arms. After lunch, he heads back to the house and loiters around lazily until 4pm, when he walks downtown to Morvayn's Peacemakers for a friendly chat with veteran smith Varel Morvayn. At 6pm he heads back to the house, picks up some food, and consumes it hastily before Jesan gets back at 8pm. He will spend the rest of the evening wandering around the second floor of the house until his bedtime at midnight. He wears a pair of coarse linens, a flax tunic, and oiled linen shoes. He carries a copy of Jesan's house key and a small amount of gold. Gorgo is well aware of his own situation and will introduce himself like this: "Gorgo gro-Shura. Soldier of fortune. Which means, more-or-less, unemployed and thoroughly pauperized." Even though his lifestyle suggests otherwise, he will tell you what he tells everybody else: "I've got a few hot prospects. I'm sure something will come through for me. Soon. Really soon."